On the 27th (Sat), get a new perspective on things with Coastal Cruises Mooloolaba and then enjoy the sea views from Caloundra Lighthouses. For traveler tips, more things to do, other places to visit, and more tourist information, use the Mooloolaba trip planner . Melbourne to Mooloolaba is an approximately 5.5-hour flight. You can also do a combination of flight and bus; or drive. Traveling from Melbourne in April, expect Mooloolaba to be somewhat warmer, temps between 30°C and 19°C. Finish your sightseeing early on the 28th (Sun) to allow enough time to drive to Coolum Beach. Coolum Beach is a beachside town on the Sunshine Coast in Queensland, Australia and is also the beach around which the town is based.HistoryThe name is derived from the local Undumbi word gulum or guloom, meaning "blunt" or "headless", referring to the shape of Mount Coolum, which has no peak.According to Aboriginal legend, Ninderry knocked off Coolum's head and it fell into the ocean and is now Mudjimba Island.The Coolum district was the traditional land of the Inabara or Yinneburra clan of the Undanbi Tribe. On the 29th (Mon), relax and rejuvenate at some of the best spas, then step into the grandiose world of Sunshine Castle, and then enjoy the sand and surf at Stumers Creek. To see traveler tips, ratings, where to stay, and tourist information, read our Coolum Beach journey builder app . Coolum Beach is just a short distance from Mooloolaba. Expect a daytime high around 30°C in April, and nighttime lows around 19°C. Wrap up your sightseeing on the 29th (Mon) early enough to drive to Noosa. 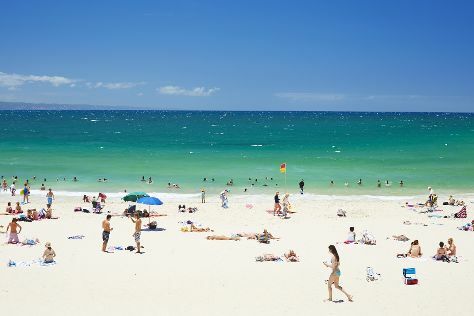 Start off your visit on the 30th (Tue): enjoy the sand and surf at Peregian Beach, then stop by Watermelon Red, and then enjoy the sand and surf at Noosa Main Beach. To see traveler tips, more things to do, ratings, and other tourist information, go to the Noosa trip maker tool . Noosa is just a stone's throw from Coolum Beach. Finish up your sightseeing early on the 30th (Tue) so you can travel back home.